Mountain Woods Furniture is one of the largest and finest aspen log furniture and pine log furniture manufacturers in the United States. All of our rustic log furniture pieces are meticulously created by skilled craftspeople in our facility in the beautiful Rocky Mountains. Our log furniture creations are available through quality rustic furniture retailers throughout the United States and Canada. Our craftsmanship, attention to detail and award-winning designs have earned Mountain Woods Furniture a sterling reputation and a loyal following from discriminating rustic log furniture buyers. 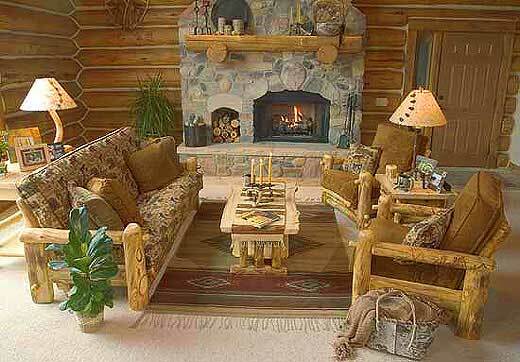 Our customers know that Mountain Woods aspen log furniture will last a lifetime. Indeed, many have already passed some of our creations to their appreciative children! We offer a wide variety of exceptional aspen and pine log furniture pieces for the living room, dining room, bedroom, home office and specialty items. Our product offerings and fabric choices are truly unequaled in the industry. In addition, whether you are a commercial account or working through a Mountain Woods Dealer, we can customize any piece in our line to meet your exact needs! It is no wonder you can find our rustic aspen and pine lodge furniture in log homes, vacation cabins, ski chalets, hotels, restaurants, ranches, retail businesses and even traditional city homes. Our customers are passionate about our log furniture—and about nature and the outdoors. Sleeping, dining or working on our functionally artistic rustic log furniture helps you reconnect with Mother Nature. 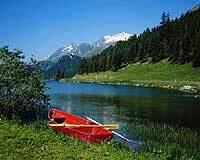 Being surrounded by Mountain Woods Furniture provides the peace and serenity experienced on a hike in the woods, or silently paddling on a crystal blue mountain lake.